At Apex Pavers & Pools, we are committed to maintaining our high quality of work and customer service. The greatest honor we could have as a company is to receive repeat business and endless referrals from loyal clients. We’re excited to share some of our recent reviews with you. If you have questions on how to get started, what type of pool designs can fit on your lot, custom paver driveway designs or outdoor kitchens, please don’t hesitate to call us today. Apex has built 2 pools for me in 4 years. They are outstanding top to bottom! They are creative, personable, on-time and install quality products! They are 5 stars in my book! Apex Pavers and Pools completed our pool a few weeks ago. We have been so impressed by everyone that has been a part of completing our pool project. From start to finish everyone that has stepped foot in our yard from this company and others they have chosen to work with has been a breeze to work with. They are all so helpful, courteous, and professional. There was never any doubt that we chose the best pool company around to make our backyard a beautiful place to be! Thank y’all so much for doing a fabulous job! We look forward to enjoying our pool for many years to come! We will definitely recommend Apex Pavers and Pools to anyone! At this point these guys are still working on my pool and deck. I am so impressed with how professional they are and how well they have handled unforeseen difficulties in the project. They are ahead of schedule and we could not ask for a better crew! I absolutely love the pool that Ryan designed to fit in our smaller space. Their crews were very professional. Would definitely recommend!!!! We were interested in a basic pool to enhance the ambiance of our backyard. Even though we asked for a basic pool my wife and I feel we got a high end product. All the equipment was top of the line and the workmanship was superb. I would recommend them to anyone. Thank you Apex Pool and Pavers for doing an excellent job! 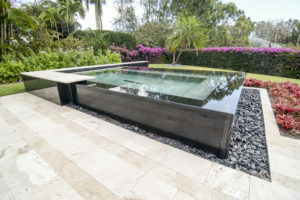 Top 5 Pool Trends for 2019: Every year, new trends appear in pool design, functionality, and tastes. We’ve scoured the internet to see what’s trending for pools and spas, and also took our own in-house trends into account. Dark interior surfaces will continue to trend for 2019. We’re seeing many requests for darker interiors, similar to those commercially designed for dayspas and high end hotels. The dark interior creates a lagoon feel, and can bring major relaxation to your swimming / lounging experience. Oversized spas are trending now, and are perfect for townhomes, villas and smaller backyard lots- lending more space to outdoor kitchens, fire features and outdoor seating. We’re seeing interest for modern dark colored glass tile paired with interesting designs in the Treasure Coast and Palm Beaches. Infinity Edge spas are fun to sit in and on. These type of spas are becoming the main focal point when entertaining and we don’t see this trend going away anytime soon. High end materials such as granite, marble, glass tile and upgrade interior finish material are being used in and around the pool/spa. Our clients don’t want basic; they are looking for something that will set their pool/spa apart from the rest and match their personal tastes. Sunshelves are perfect for lounging by the pool and our clients are requesting them often. Setting up a lounge chair and dipping toes in the water is perfect for those that want to enjoy just a little splash but a lot of sun. No matter where you’re at with your pool planning, our design specialists can make you aware of industry trends and how to incorporate them into your new pool. If you would like a complimentary quote, please feel free to contact us today. For Treasure Coast residents, call 772-419-5151, and for Palm Beach County residents, call 561-844-9370. 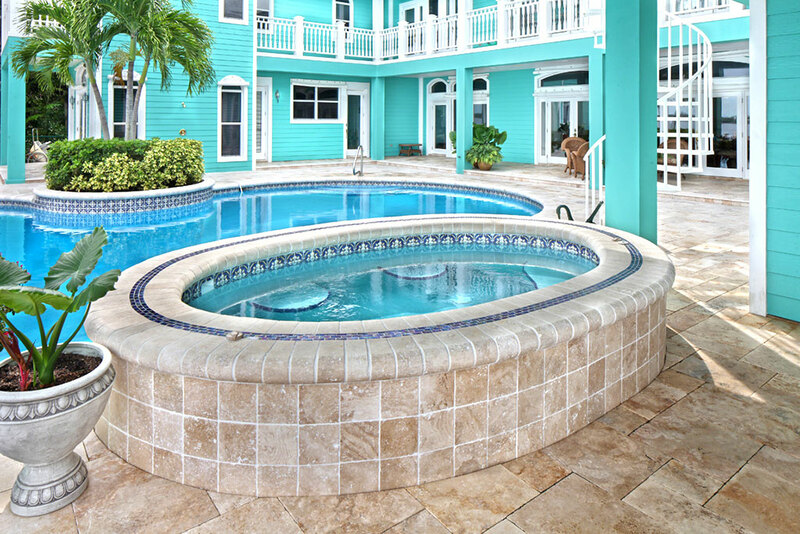 The biggest shift in pool design is tinting the interior color of the pool to a darker shade of blue. The effect is a more restful, natural palette and creates a reflective surface for the sky. Minimalist Pool Colors: As we leave the mid-century turquoise/white interior color in the past, homeowners are looking for darker, more natural colors. In terms of shapes, we’re seeing simple shapes with integrated spas lined with glass and other light-reflecting materials. 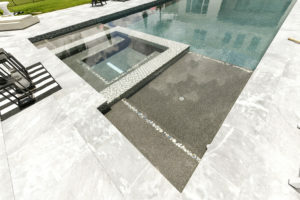 Minimalist pools can be architectural or natural in shape. Architectural pools are often rectangular or classic in shape and follow the home’s architecture. They will mimic the colors in the pool deck, coping and waterline/step tile. Natural pools follow the shape best suited for the lot/land and will complement the surrounding environment. These pools likely have rock waterfalls, beach entries, and other items found in nature. Our team at Apex Pavers & Pools aim to design and build a pool that you will love for years to come. 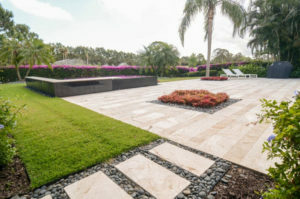 Contact Apex Pavers & Pools today at 772-419-5151 (Treasure Coast) or 561-844-9370 (Palm Beach County). 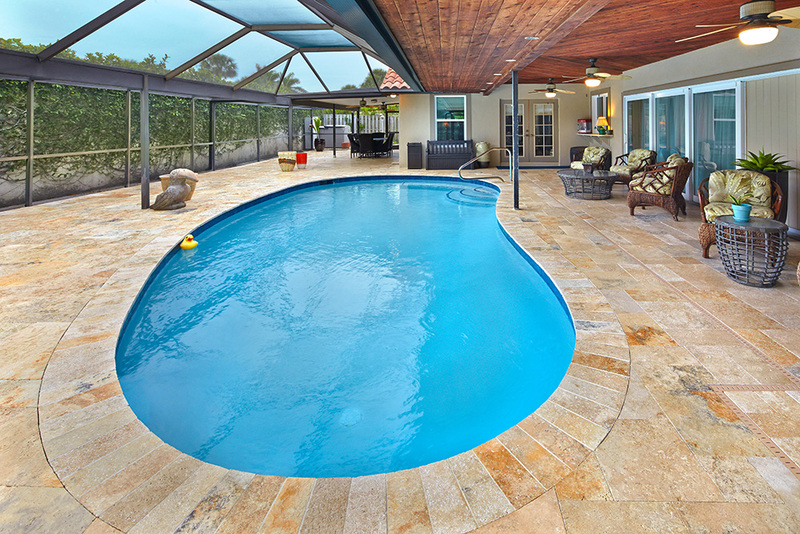 We understand selecting a new custom pool builder can be difficult. 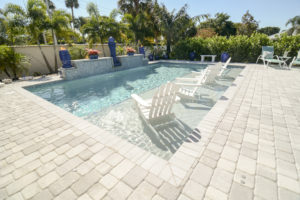 With so many pool contractors to choose from in the Treasure Coast and the Palm Beaches, how does Apex Pavers and Pools stand apart from our competition? It’s simple: we put our customers first. Building a pool isn’t like building an addition to your home or getting a new roof. Many of our clients have dreamed of building their pool for years, and our goal is to bring our client’s vision to reality. When our pool specialists meet with homeowners for the first time, we’ll ask how they envision their backyard oasis. We want to know if they entertain often, like to grill, and if they plan to use the pool frequently. During our visit to the home, we’ll take note of the existing view so we optimize the space and enhance the surroundings. We’ll note how the home sits on the lot and maximize the backyard space to its fullest potential. We are thankful for our wonderful clients whom have contracted us more than once to build pools for them. We are grateful for their reviews on our Facebook page, Google My Business page, and Houzz. We earn many our clients through word-of-mouth, and we couldn’t be more honored. Recently, we’ve had the opportunity to update our pool photo gallery, so please check it out! If you would like a complimentary quote on a new custom pool in the Treasure Coast or Palm Beaches, please contact us today. We look forward to building the pool of your dreams! We are proud supporters of the Humane Society of the Treasure Coast. In April, we supported the Run Fur Fun, a fundraising event for HSTC. The event raised close to $10,000 this year. To read more, click on the link. In addition to the Run Fur Fun, we also support Wagging Tales magazine, a monthly publication from the Humane Society of the Treasure Coast. Right now, with every 500 sq ft paver purchase we’ll donate $250 to the Humane Society of the Treasure Coast. View our coupon in the Wagging Tales magazine by clicking here., or download the coupon below. 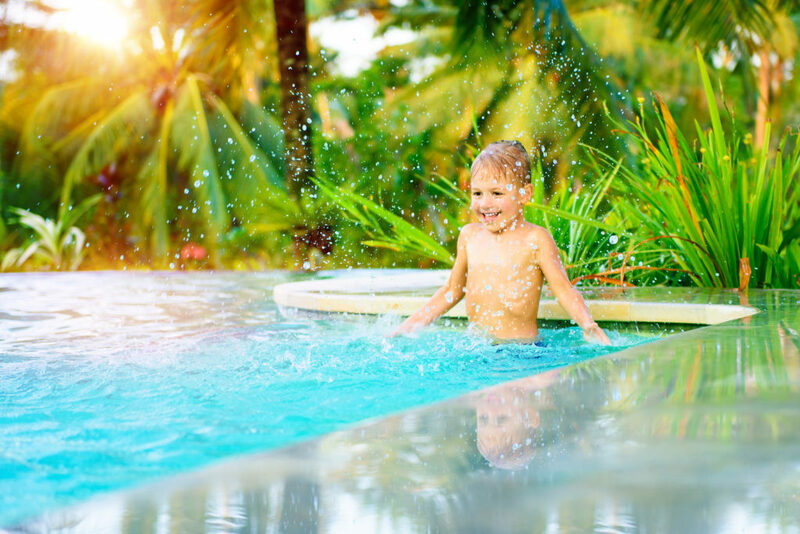 Ultraviolet Pool Sanitizers are becoming a popular addition for homeowners looking to reduce the amount of chemicals in their pools. What is Ultraviolet Light and how is it used to sanitize pool water? UV light does kill the bacteria, germs and viruses, however it will still need a secondary level of protection, provided by chlorine-based sanitizers. Contact our pool specialists at Apex Paver & Pools today to learn more about Ultraviolet pool sanitizers and other filtration / sanitation options. 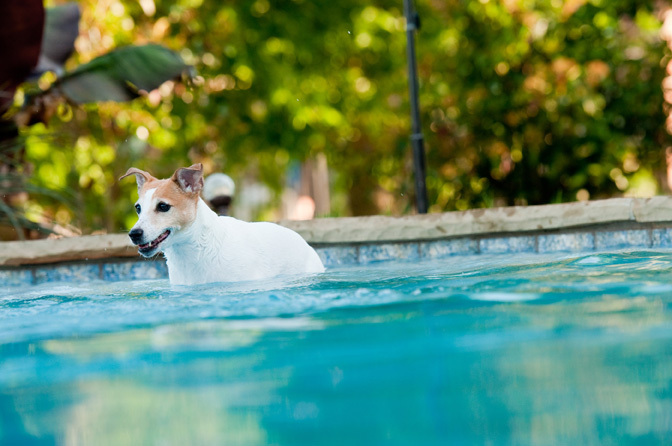 3 Reasons Why Lap Pools are Great for your Health! If you plan to use your pool for exercise, let our pool design specialists at Apex Pavers & Pools know. We can design a pool that will help keep you healthy under the Florida sun. We’ll design and build a lap pool to suit you and your family’s needs. Ideally, lap pools should have an extended length (at least 45 feet long) and a width of at least 8 feet for a single swimmer (add 4 feet for an additional swimmer). The depth must be deep enough for turns at each end, and we recommend at least 4 feet deep. 1. Heart Helper: Swimming provides unparalleled cardiovascular conditioning, provided you practice consistently and with good technique. : Swimming builds longer, leaner muscles that complement the shorter denser muscles that develop from weight training. 3. 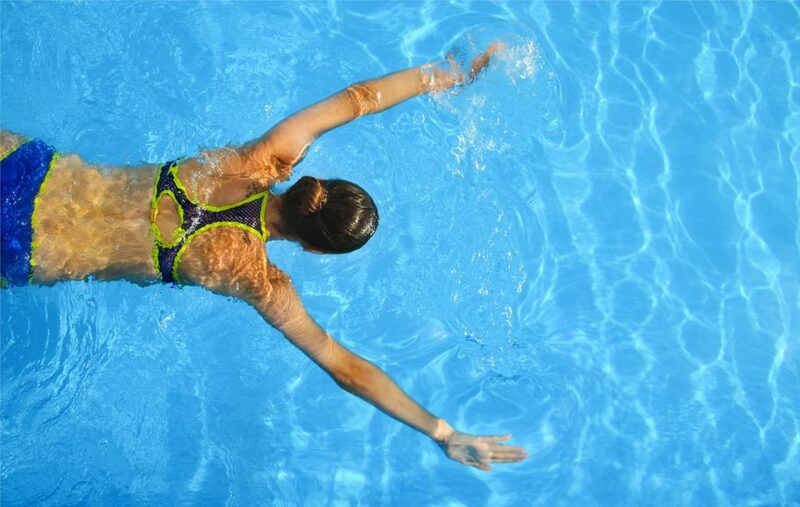 Cross-Training: Swimming not only boosts cardiovascular capacity while increasing muscle strength, but it also gives your body a break from higher-impact activities like basketball, running, and weightlifting. Schedule a complimentary consultation with our design specialists to see how you can get the most out of your pool. Contact Apex Pavers & Pools at 561-844-9370 (Palm Beach) or 772-419-5151 (Treasure Coast) to learn more. Let’s take a look at Mediterranean pool design and how to incorporate it into your backyard space. South Florida homes frequently borrow this type of architecture and create a type of Spanish Revival, which we’ll focus on in this blog post. You’ll see elements of this design throughout Florida with the use of formal architectural details, stucco walls and barrel roof tiles. Our ultimate goal at Apex Pavers & Pools is to design a pool area that seamlessly flows into your existing architecture while creating an enjoyable outdoor space for years to come. Integrating a few Mediterranean elements into your design enables us to carry the style into your pool shape, tiles and decking. Materials: Lining the inside pool line with tumbled marble and matching the look on the pool decking is used often in Mediterranean pool designs. Alternatively, using brightly colored tiles in blue and orange hues can give your waterline a pop. Glass tiles can be used for the interior of the pool and a patterned geometric design can also be used on the bottom for added interest. Shape: Mediterranean pool designs are often simple geometric shapes with square or inverted radius edges. Steps are centrally located (not corner entry) and if a hot tub is included, it is also usually square or 1/2 circle and located along the center of the pool’s length. Grass: Simple geometric shapes are used not only in the pool’s shape but can be also be incorporated around the pool. Using grass between the deck material softens the hard lines often associated with Mediterranean design. Water Features: Simple fountains designed from ornate greek figures, fish, or trickling from a raised wall are also nice Spanish Revival features. Decor: Urns filled with vines, bougainvillea, or a flowering bush will complete the Mediterranean look and feel of your backyard space. At Apex Pools, our pool design specialists can create a professionally-designed backyard space that will complement your home beautifully. View our portfolio on Houzz, and when you’re ready, contact us today at 772-419-5151 (Treasure Coast) or 561-844-9370 (Palm Beach County). 2017 is underway. Have you given additional thought to a new pool or outdoor living space? Let us help create your retreat so you can better enjoy your backyard space. In this month’s post, we’ve highlighted some of our most popular requests from our clients. If you have an odd-shaped lot, no worries. Our designers get creative with any sized lot, large or small. We’ll ensure clearances are met, and that we make the best use if your outdoor living area. Read our recent blog post about small spaces. Easily controlling your pool equipment is becoming mainstream to the pool and spa industry with the use of mobile devices. Did you know that you can control your spa with your phone or tablet? You can set the temperature, jets, lights, pump, and waterfalls easily with a touch of a finger. Also, you can set an alert if your pH and chlorine levels are off. Waterfalls and rock walls bring nature into your backyard. 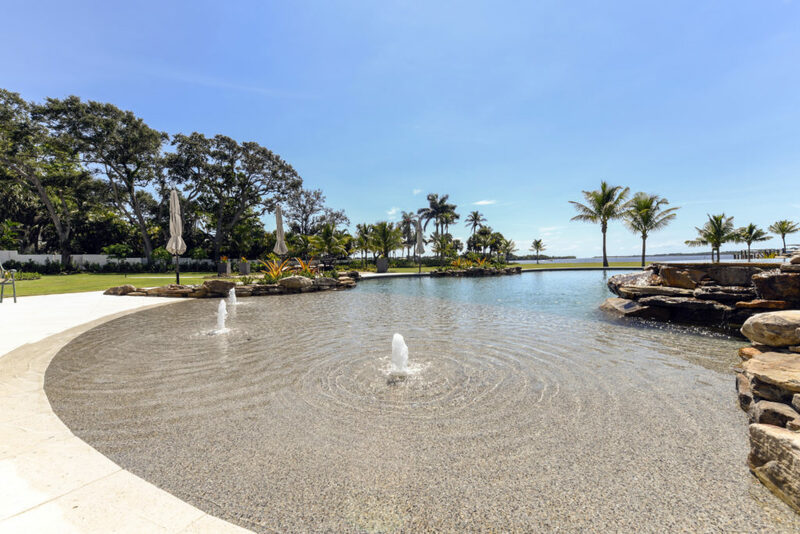 Waterfalls provide a relaxing trickle of water (or a rush of a waterfall, depending on your selection) and rock walls can bring your surrounding environment into your pool area. 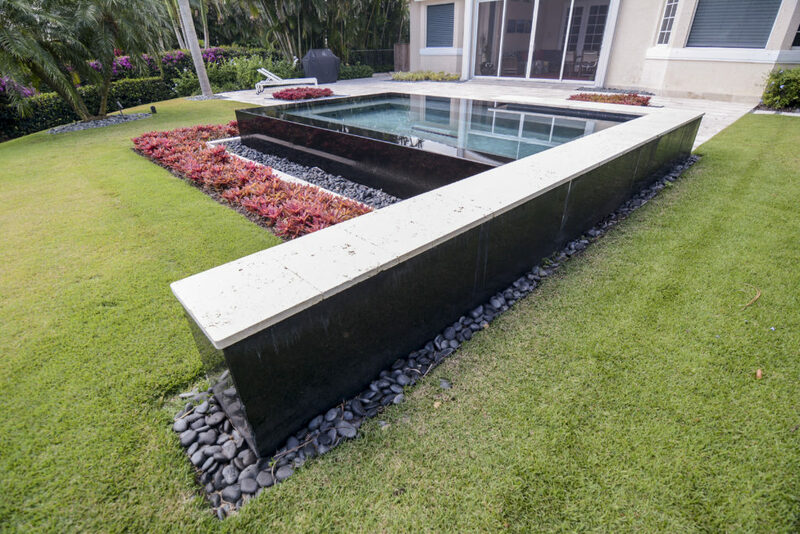 Our designers will help you select the perfect type of rock and amount that is appropriate for the space, and will also discuss placement and protecting your new rock waterfall. Make an appointment now to review pool shapes, new pool tiles and finishes, coping selections and paver decks. Let us help you build a new backyard experience! Adding a Spa: Now or Later? When is the best time to invest in a spa? If you’re adding a new pool and are on the fence about a spa, read on. Construction: Adding a spa during construction reduces overall construction costs: 1 crew scheduled, proper electrical and plumbing configured at the time of design. Electrical: A spa requires additional wiring for a light(s) and pump. Installing the spa during pool construction will allow our pool specialist to help you select the right sized and powered pool pump and heat pump. Materials: Materials used for the pool and spa will match if installed at the same time, since they are usually from the same lot. For example, trying to match coping or waterline tile to a pool that has been soaking in the sun for years is practically impossible. Why risk the mismatch, when you can do it all at the same time? Time: Adding the spa during pool construction saves you time during the design phase, permitting, and construction (and possibly your HOA), since it only has to go through approval once. Let our specialists at Apex Pavers & Pools help you build the pool of your dreams! Contact us today at 772-419-5151 (Treasure Coast) or 561-844-9370 (Palm Beaches). © Apex Pavers & Pools. All rights reserved.